In case you didn’t get a chance to visit My World Made by Hand to see my DIY Milk Glass project, I wanted to share it with you here. Whenever I see these white bumpy vases and glassware, I always think of my grandma and my granny. They used to have pieces like this throughout their homes and seeing them takes me back to my childhood. This beautiful glass has a long history and is called opal glass, or more recently, milk glass, due to its white color. While this stuff is pretty easy to come by, I thought it would be more fun to try to make my own version of milk glass. I had to try a couple different ways in order to find what worked, but isn’t that how it goes? For example, I first tried to recreate the bumps with a hot glue gun. That was messy and sloppy and painful at times. But after experimenting with puffy paint, I knew I had a winner. 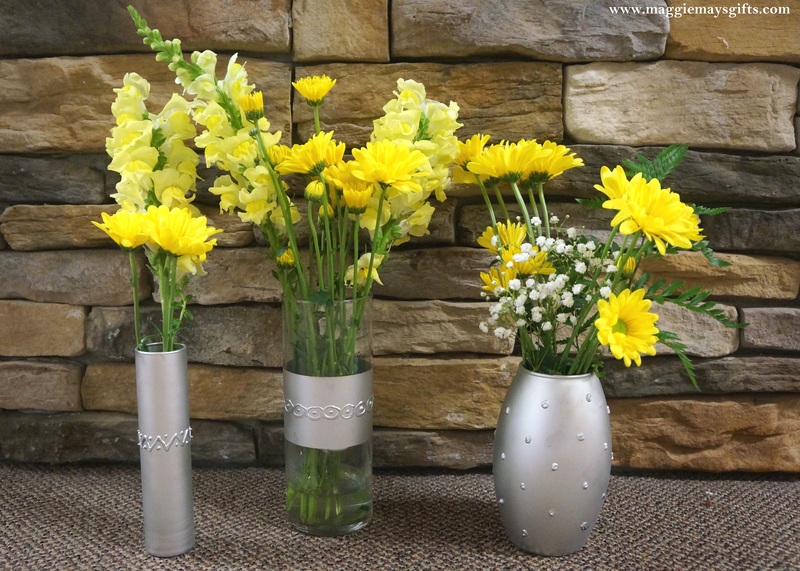 All you will need are some clear vases, puffy paint, and spray paint. If you already have puffy paint in your craft supply, great. Any color you have will work because we are going to paint over it. If not, they sell it at any craft store. The nice part about making your own milk glass is that you can create whatever design you want. Just paint your design directly onto the glass with the paint. I used painter’s tape to block off sections that I wanted to stay clear. After the puffy paint dried, I just sprayed over the entire outside surface with spray paint. I could have used white to stay with the white milk theme but I wanted to make silver vases. You can use any color you want. I highly recommend using a craft spray paint for this as opposed to painting with a paint brush. It is soooo much easier and will look a lot better, too. Just let the paint dry and you’re all done! If you like these posts and want to receive them in your email, just click the Follow button now!